Karen Carson of Brighton fell out of her wheelchair while attempting to use a ramp leading to the City Council chamber to speak at a public hearing. Karen Carson came to City Hall in her motorized wheelchair to advocate on behalf of the disabled at a March public hearing, but she never made it to the microphone to testify. Carson’s journey ended when her motorized wheelchair caught the edge of an aging temporary ramp, spilling her onto the floor, officials said. The accident highlighted a lack of accessibility in the City Council chamber. “I basically fell out of my wheelchair,” said Carson, who sprained her left ankle. After Carson’s accident March 21, Council President Michelle Wu stepped up her push to improve accessibility inside the chamber, the largest public gathering space in City Hall. The first step: replacing the ramp, which a city spokeswoman said did not comply with the Americans with Disabilities Act. “It really underlined to us the urgency of having a space that is fully accessible to everyone,’’ Wu said. Wu, who had been convening disability advocates and officials from Mayor Martin J. Walsh’s administration, pressed for long-term improvements and upgrades to help disabled citizens. Ideas flowed. Should they install inclined walkways in the council gallery? Can there be better access to the rostrum? The Christopher A. Iannella Chamber has a spacious gallery overlooking the council well. Able-bodied people walk through one of four wooden gates and down three steps to stand behind a lectern and give testimony. But wheelchair users must exit the gallery, roll down a concrete hallway, and pass through an office before entering the ramp that extends to the council floor. City officials settled on two options: either move the ramp to a public entrance inside the gallery or raise the council floor, so wheelchair users can easily roll to a microphone rather than loop around to the back of the chamber, said Kristen McCosh, the city’s disability commissioner. “They are [both] necessary because we need to allow equitable access to the public onto the chamber floor, where they shouldn’t have to go to the back,’’ said McCosh, who uses a wheelchair. Officials, with help from consultants, are weighing several factors — including cost and timing — before finalizing a design plan, which would have to be put out to bid. A permanent solution could be in place within nine months to a year, McCosh said. On Friday, the city plans to offer a short-term fix. Officials will replace the ramp, which has been there since it was hastily installed 17 years ago to accommodate Dapper O’Neil, a former city councilor who used a wheelchair for a short period during the last of his 28 years in office. Over the years, the ramp became a critical bridge for wheelchair users who needed to address councilors. The new ramp will be wider and longer than the old one, and cost less than $4,000, Boston’s chief of operations Patrick Brophy said. Some councilors’ desks inside the chamber will have to be moved to accommodate the ramp, which officials said conforms to the Americans with Disabilities Act. “When we find something that isn’t working, we try to fix it,” Brophy said. “It came to our attention that this [ramp] obviously is not working to the highest and best use possible. “We want to make sure no other injures ever occur there,” he said. Advocates hail the plan, saying if done correctly it would bring more people to council meetings. 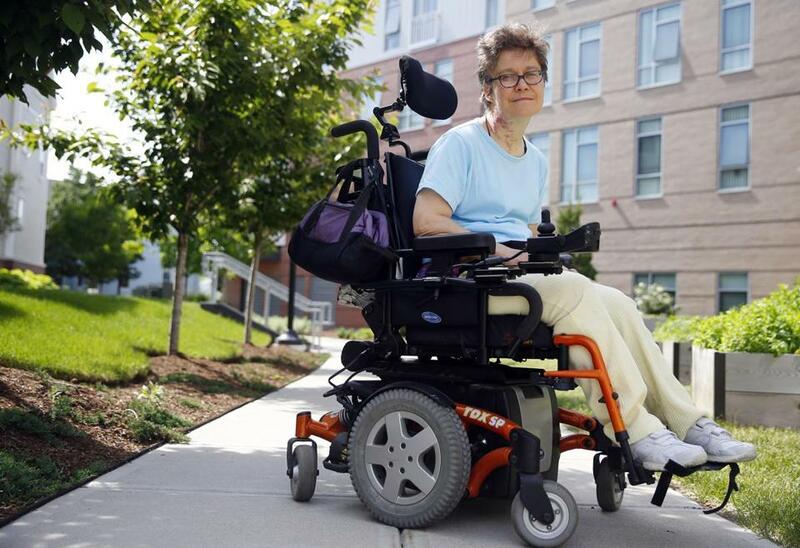 “A lot of people with disabilities are reluctant to testify because they think [getting around there] is too just too difficult,’’ said Karen Schneiderman, senior advocacy specialist at the Boston Center for Independent Living. The new ramp comes as city officials, working with a consultant team, are urging a series of fixes to better serve people who are disabled. It is part of “Rethink City Hall,” the mayor’s initiative that aims to make the aging building more welcoming. The city has upgraded handrails, bathrooms, and access paths. Officials are also figuring out the City Hall offices that disabled people use most and are modernizing them. In the past two years in the council chamber, officials installed an audio loop for people who are hard of hearing, large television monitors, and closed captioning on council broadcasts. On the day of her accident, Carson, who has cerebral palsy, was attending a hearing on whether to establish city-funded housing vouchers. The Brighton advocate had hoped to speak about hardships faced by people who are disabled and have low incomes. After the accident, she said, councilors and a woman testifying on another matter rushed to her side. Security was summoned. “I knew I had done something with my ankle,’’ said Carson. She was taken to Massachusetts General Hospital and then spent a week in rehab. “I don’t think that ramp was designed to hold a heavy power wheelchair,” she said. Two former city councilors said the ramp was installed in 1999 when O’Neil became seriously ill and needed a wheelchair. “He wanted to come to the hearings; he wanted to come to the meetings,’’ recalled Maureen Feeney, a councilor at the time and now city clerk. Stephen J. Murphy, a former councilor who served with Dapper O’Neil in the late 1990s, said O’Neil was living in a rehab center and coming to City Hall by ambulance. Murphy said Jimmy Kelly, the council president at the time, decided to get the ramp to assist O’Neil. “It was supposed to be a temporary thing,’’ Murphy said.